After breakfast we headed down and found Getchin and made ready for going to the town of Taal where he teaches on Saturday mornings. It’s training from 8-10 in the park in a town that have great preserved houses from the Spanish area. 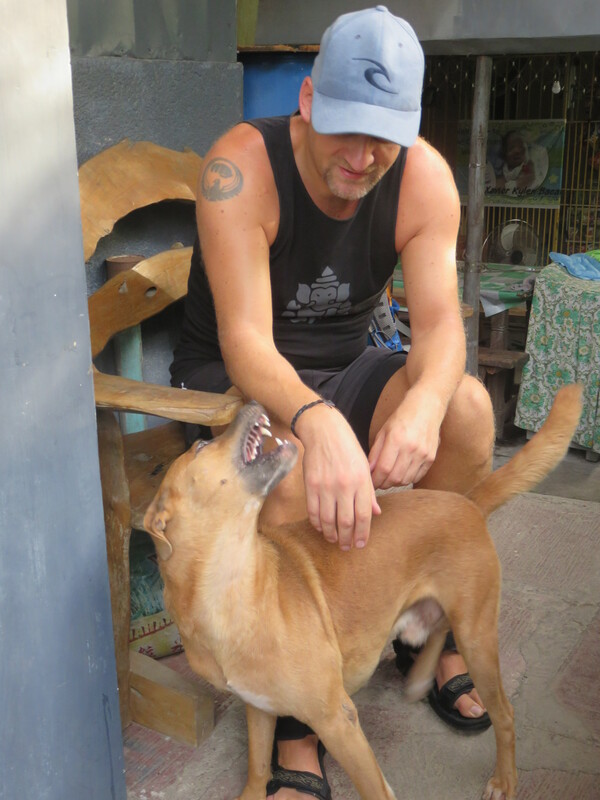 Remember the dog with the name “Street dog”? Not everyone gets to cuddle with this one. We got into the DAS-Mobil and got company of a couple of gentlemen. One was Getcin’s uncle, by the way. They train Arnis also and join in at the training in the park. We were a small but committed group and had a great training. Getchin is not just a good Arnisador, he has also picked up his fathers teaching methods and is a good teacher. We did empty hand, double and single stick. Strangely there are few locals that practice Arnis here. GM gives free lessons and offers free sticks to the kids in the neighborhood, but he tells me no one shows up. There are really no good excuse for this, and it’s sad to see that there is only a chosen few who will carry the heritage. As long as there are big groups all over Europe and America, Arnis will have its life and progression, but it’s like no Korean should do Tae Kwon Do or no Japanese do Karate or Judo. There is something wrong with that picture. Anybody get a flashback to Gullivers Travels? After the training we went into the church of Taal. It’s built in 1575 and one of the oldest around here. It was beautiful. Big paintings on the wall, and ornaments and statues on the inside. Classic Catholic, in other words. We got in the DAS-mobil and went to a Balisong factory. First thing first, a Balisong is commonly known as a butterfly knife. One of those that looks really cool when you know how to work it and flip it open in one of many ways. This knife is “mostly” illegal in Norway. I say mostly because it’s not the form per se that’s illegal, but the fact that these knives are stabbing knives. There are no practical use for a stabbing knife other than, well… Stabbing. And you really shouldn’t do that, but I guess that goes without saying. The Balisongs are produced in Balisong and are a big part of the old weapon tradition in the Philippines. From old, everyone carries a knife. Wether it be for cutting fruit, cutting grass or just slaughter your neighbor. When I say we was at a Balisong factory you should take into consideration that a factory’s around here are a shed in the backyard where things are produced. Getchin knew these guys and was instructed by GM to take us there. We got to see the guys work and it was clearly lined up with tasks produced at different stations and a solid set of knives were under production. We tried to talk to a couple of the guys but there were no talking during work, it seemed. We drove further back towards home and stopped at a sales stall. 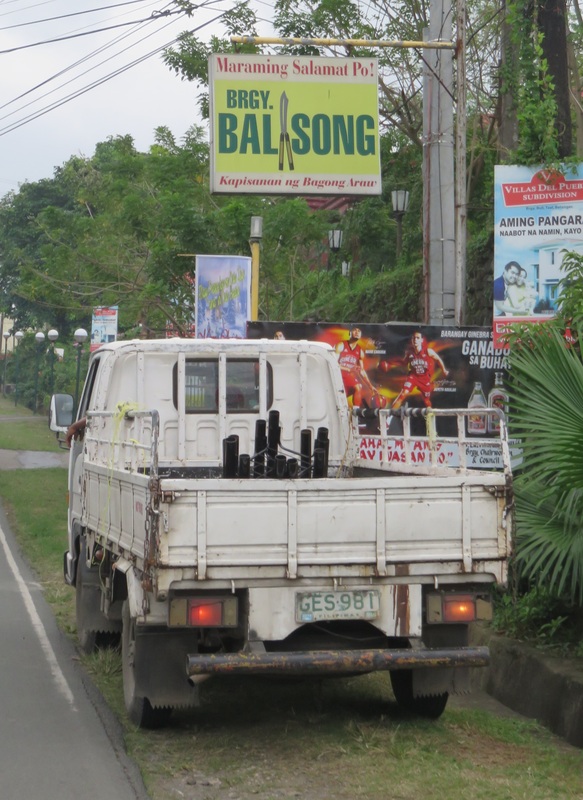 You can buy Balisongs every fifty meters on this road, and more importantly they also sell “trainers”. A knife that is rounded and not meant to be sharp. 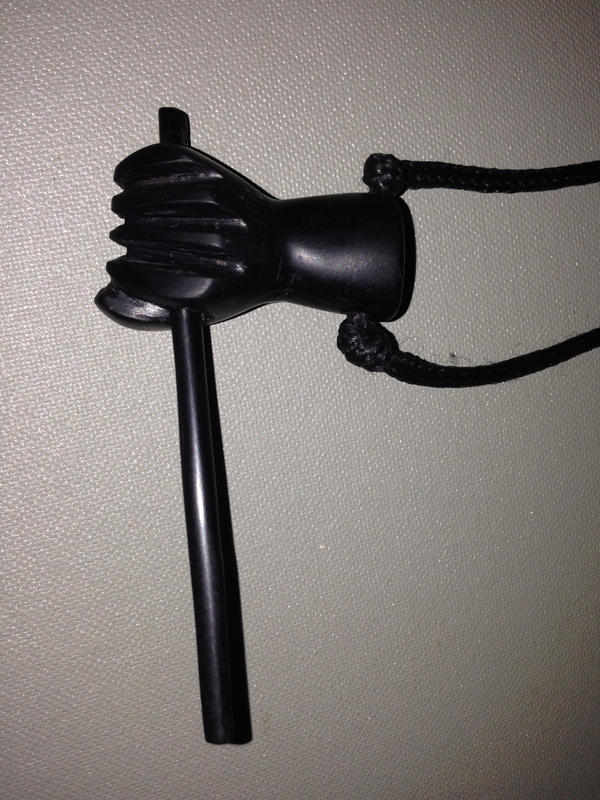 This gives you a plaything that ensures you keep all ten fingers after each lesson. We got us a couple of trainers and went home. I don’t know what to choose. Can I have only one? Practicing with the Balisong is a way of keeping the traditional Filipino culture alive and you would not believe how many ways the knife can be moved, flinged, flipped and tossed for opening and closing. It’s fun, but an utterly useless knowledge. We got on the bike and headed to town. I have said I want to experience the local burger join, Jollibee at least once while we are here. We did, and my junk food gene is now satisfied for an extended period of time. Not that it’s bad, but junk food is still just junk food. Better to have some of the local dishes even though they lack any decent amount of vegetables. We grabbed a coffee and prepared a little video for the karate people back home. It’s the yearly Christmas party tonight after the training has ended and the grading has been done. Hopefully our video will be played on the banquet. Time will show. As we drive through town Katja get this great idea to enter a Spa. Right, ’cause that doesn’t take too much time, and I who only have 40% battery left on my phone. It all works out pretty well. They have a corner with a couch and thereby a husband shelter with free WIFI. I sleep for a while, something that probably would be frowned upon in Norway, but here seems to be the most natural thing in the world. I finally come around again and Katja comes out not long after. Full body massage (1 hour) and waxing of legs cost 800 pesos = 130 NOK = 14 EURO. After that we do our grocery shopping and head back home. On the way we stop and buy a plant for GM and his wife as a little gifts before our coming departure. Katja is getting more and more local and we end up driving a motorcycle with a big bonsai with flowers and it’s in a huge ceramic pot. Two ceramic big things, actually. One fits in the backpack, but the tree and the larger pot had to be put between us on the bike. As I said, like a local. And the flower salesman had lived in Grimstad in Norway for a time and was happy to hear Norwegian again. So happy that he chipped in another little plant. GM’s wife was very happy for the gift and promised to take good care of it. 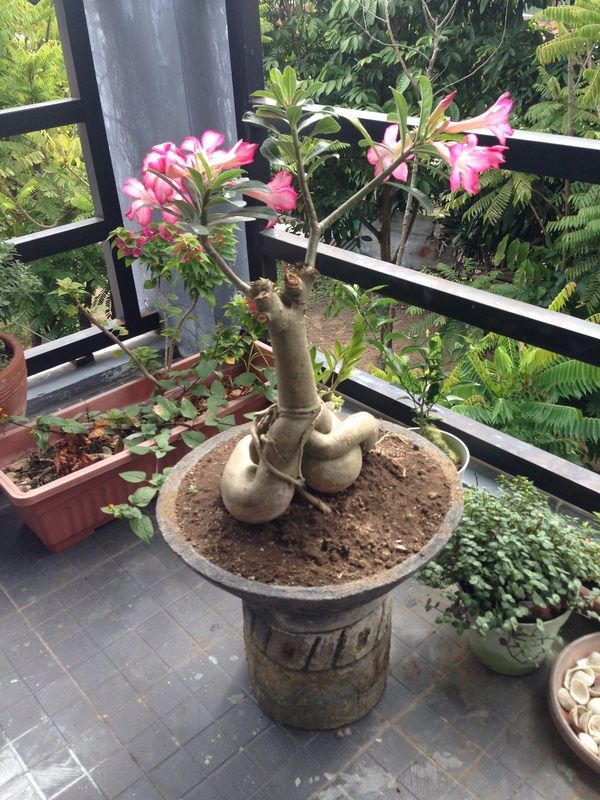 Katja and I call this tree “Bali flower tree” as they grow all around Bali with beautiful flowers. Hopefully it will yield a lot of pretty flowers here as well. Now it’s time to look for dinner. We get back up on the bike and head further north. We think there is a market down there that should be good for buying fruits. On the road it start to get dark and there is no light on the bike. Not good. Speeding around in the dark is heavy enough WITH a front light in the bike, without is to close to a dear trap for my comfort. I pull over and start pushing all and any buttons to no avail. Until I push the one switch with a red triangle. Where I come from that’s the emergency light, but here it was actually two such switches and the one works as emergency, the other as a main switch for the light. When I was riding bike in night time on Bali I had bugs in my eyes every 100 meters. I have therefor gotten myself a pair of blank protective glasses. You know the one used in metal shops and so forth. They came in handy when driving through the darkness here. With my lips pressed tightly together (a feat not very often performed by me) I took a lot of the bugs in the face, but did not get any in my eyes. We got to the market and bought some fruit for tomorrow’s breakfast and a grilled chicken for dinner together with a couple of San Miguel beers. We got home safely, parked the bike, ate the chicken and then we got visits from GM and his wife. We each got a t-shirt as gifts and we walked through the accounting of our stay. We’ve been really lucky to get so much time here. Usually they have bookings for quite some time in advance. So it was lucky for us it was an opening both when we showed up and also when we prolonged the stay. It’s a guy coming in from UK the day we leave, an Australian coming on Wednesday and more are lined up after that. Lucky us. little hand grabbing a stick. It’s really nice craftwork and we will carry them in the times to come. We also bought another Balisong trainer so we can flip and flick one each when we get back in the sofa at home. Everybody is happy and we can rest easily knowing what we have got and that we have made up our bill. Or sort of. We have a big shipment back home that Cydel will help us with and we have no idea what that’s gonna cost. (Bendik, who do you think will be the receiver of this package?) So we’ll have to do an aftermath on that and pay the last we owe when we get back from Puerto Galera.